We are half-way there! Half-way to loving more like God! We've got this! 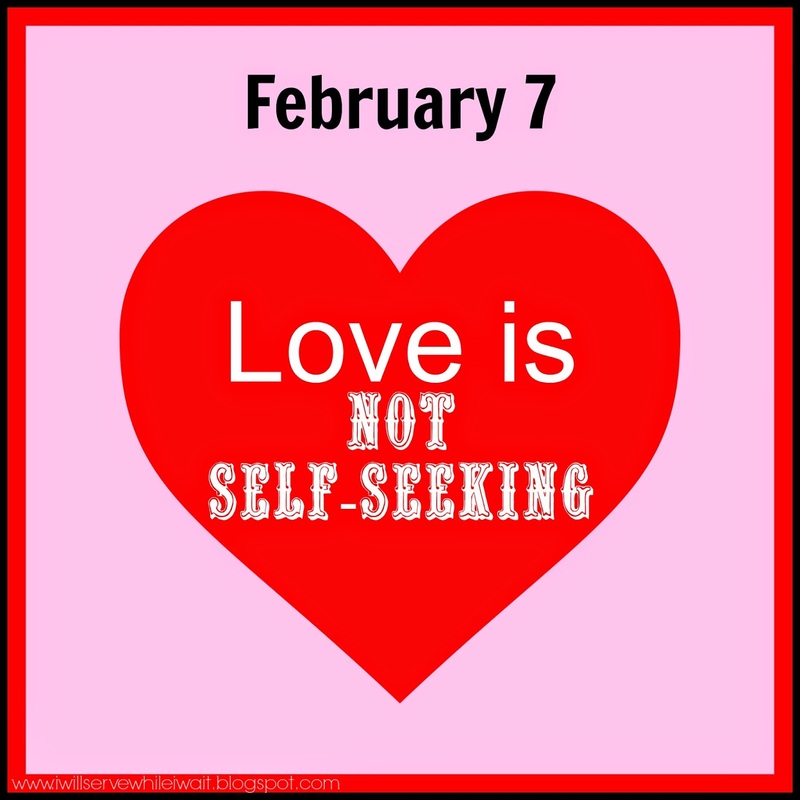 The seventh characteristic of 1 Corinthians 13:4-7 is love is not self-seeking. I always enjoy looking at the other versions. Let's see what they have to say. Love isn't always "me first" (The Message), love is not selfish (Easy-to-Read Version), love does not demand its own way (Living Bible), it's not self-absorbed (The Voice). Hmmm...yep, guilty as charged. How many times have I deferred to do something for me instead of playing a game with one of the kids? How many times have I not gone with Mike to play golf because it's "just not MY thing". How many times have I manipulated an agreement just to get what I wanted? This is not love. But, you know what love is? Love is a Savior that came to DIE for us so that we could be saved. He didn't come here to be served but to serve others. We have such an awesome example of pure love but it's easily lost in our extremely selfish world. How many times have you been told, "if you don't look out for yourself, no one else will" and sadly we start to believe this. Like I've said before, it's small shifts in our thinking that will help us love like God. 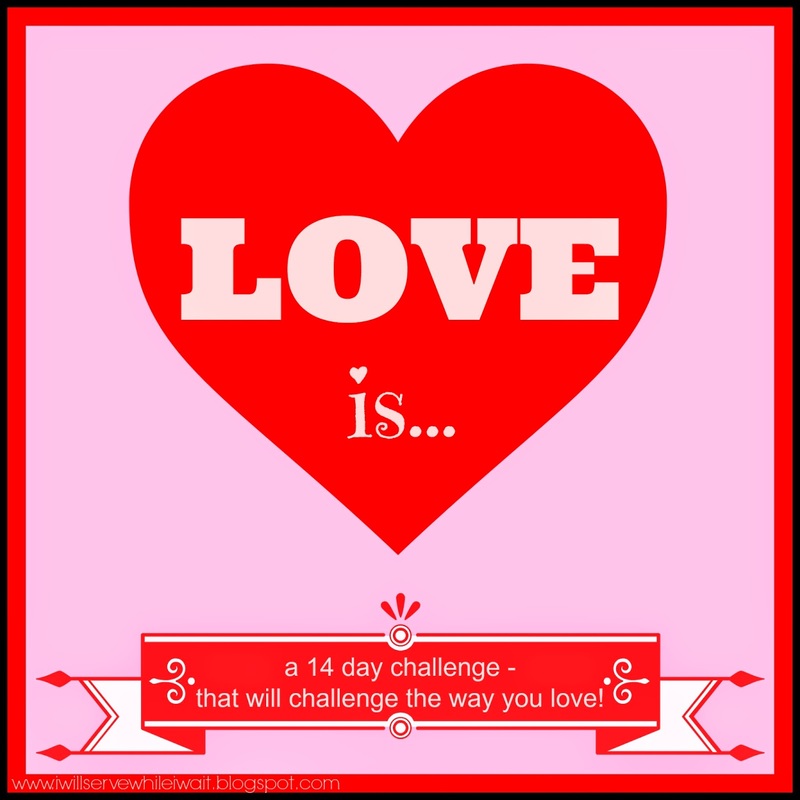 It makes me so happy to have you going through this Love Challenge with me! I know we all have our struggles. I want you to know I'm here for you. Let me know if there is something I can pray for. We are all in this together (a little High School Musical shout out!). ;) ok, I'm totally showing my age! I just want to thank you for sharing this study of love with all of us! It has really opened my eyes to things I didn't think about much before. I think it's really difficult to not manipulate a situation to get what I want...i am guilty of sometimes swaying my children's choices to make things easier on me...even with silly stuff...like their breakfast choices. Ugh, totally selfish!! We are all a work in progress just like you've said before...and thank God again and again for his grace & forgiveness! Sara- I don't think you can find a mom out there who hasn't done this with their kids. I think as long as it is not an everyday occurrence, we need to give ourselves a break. How can we truly be loving of others if we are not happy with or love ourselves? Such a tricky balancing act, right? I believe I will always be a work in progress. Why did I think I had the hardest time with patience and envy....with every day I read I am convinced I have a lot more work to do! This has been so great...thanks for taking the time to pull it together. I feel like it's been my own personal little bible study! Crazy, huh?! When I started this I knew I had work to do - I didn't realize I needed that much! Glad you like it! It's been fun (and challenging!) to put together!